A Ukrainian octopus named Pavlik after the famous Paul the Octopus is ready for an important mission – to predict the results of matches during Euro 2012. ­The creature did not however get a chance to start work on the first day of the tournament: technical problems at the zoo forced him to skip the first games. “Pavlik will be ready to predict results on Monday when the Ukrainian team kicks off the game,” said Viktor Zhilenko, director of the Alushta aquarium, where the octopus lives. 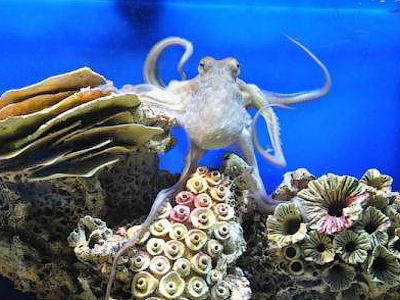 Born in Alushta Zoo, Pavlik the Octopus is seen as the successor to German-born Paul. When Spain beat Germany in the World cup in 2010 it came as little surprise to those who believed in the unbelievable. The result had been foretold by Paul the Octopus, a creature that achieved celebrity status with the accuracy of its predictions. Pavlik was trained all winter. The octopus bets by choosing one of the boxes with the names of the countries written on them. Ukrainian Pavlik has already proved quite precise in predicting the results of some European matches played by the Ukrainian team. Although both Ukrainian and German octopuses belong to the same Mediterranean group it still remains to be seen if Pavlik’s other predictions will be as accurate as Paul’s.